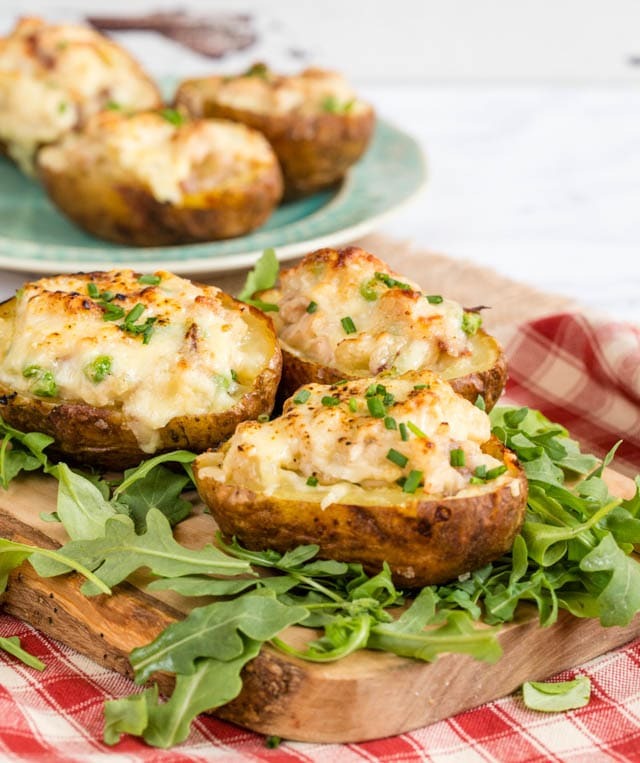 Delicious turkey, ham and cheese stuffed twice baked potatoes are an easy recipe, perfect for a budget friendly festive feast that will please the whole family. Christmas can be a really hectic time; in theory it might be the most wonderful time of the year, but it seems a bit of a race sometimes. Shopping, seeing family and friends and cooking, cooking and more cooking mean that both time and budgets are under pressure. All I want is to relax with good food and enjoy the season. 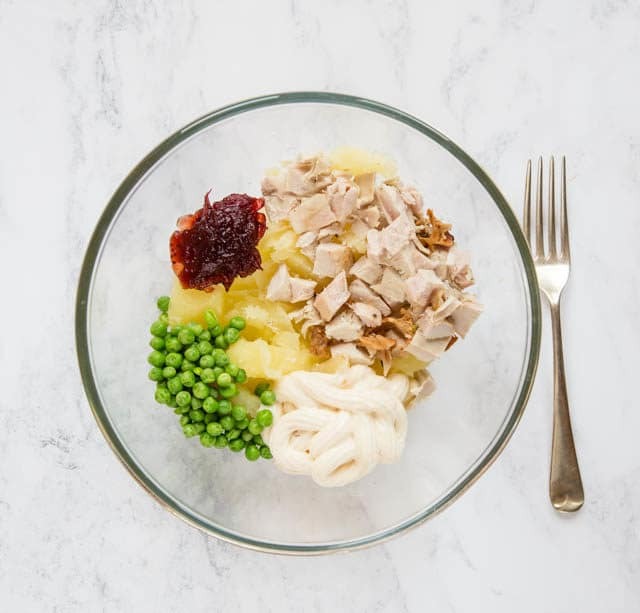 My festive twice baked potatoes are perfect made with chicken in the evenings before Christmas, after a day out, or some last minute shopping, or ideal to serve up at a buffet as they use both turkey and cranberry sauce leftovers. My festive twice baked potatoes have all the convenience of baked potato, but leveled up to something far more interesting by scooping the potato out and mixing it with turkey, cranberry sauce and Primula cheese with ham, then filling the potato skins again, topping with grated cheese and popping back into the oven briefly to melt the cheese. . The secret to scooping out the potato skin neatly is not to get all the flesh out; rather, score around the edge about 5mm / 1/4 ” in from the skin and then spoon out the middle. 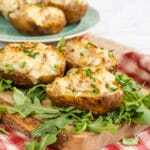 By leaving a layer of potato with the skin, it makes the potato shell more robust and easier to handle. 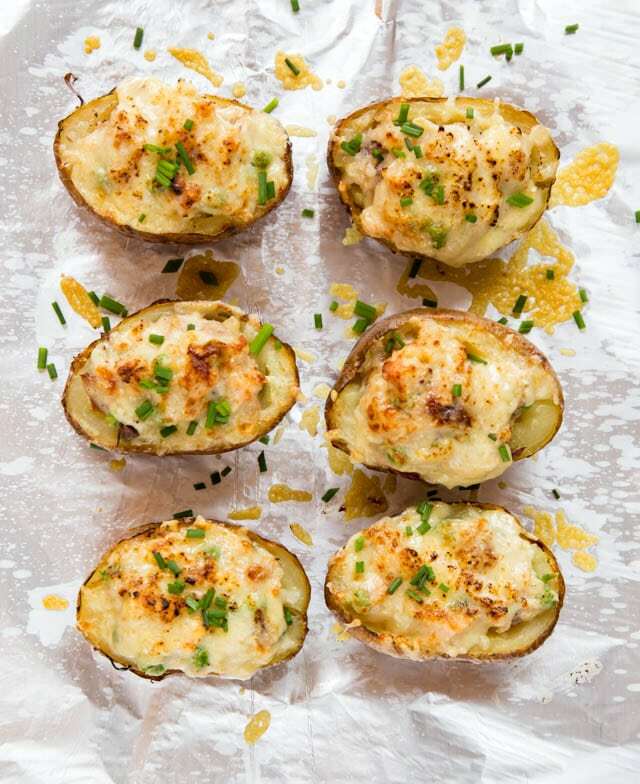 These twice baked potatoes are delicious as a filling and hearty meal, particularly as a way of using up Christmas left-overs, but they could also be made as party canapes by using small bite sized potatoes. For this, adjust the baking time downwards as required to about 25 minutes or so, depending on size. 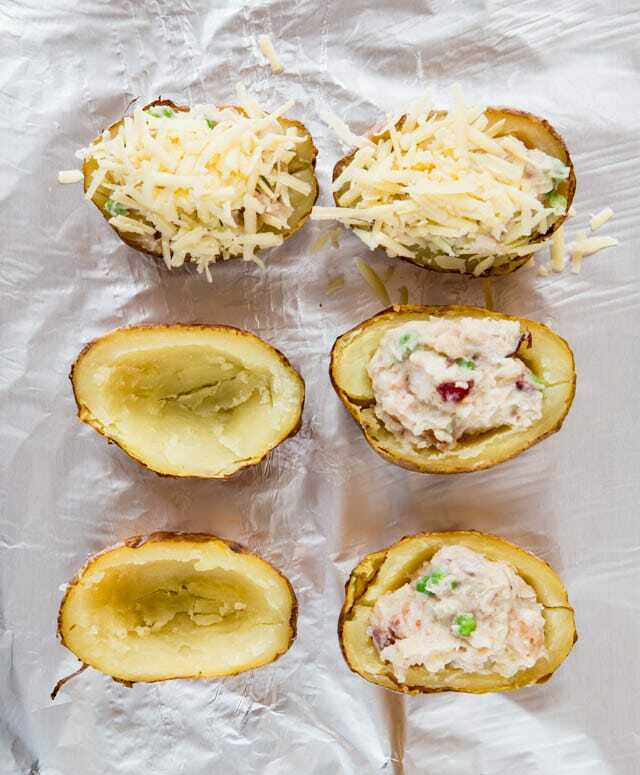 Baked potatoes are far better when baked in the oven, but sometimes you need one faster than by baking purely in the oven – so simply start the spuds off in the microwave. Wash, oil and salt them as usual, cook on full power for about 4 minutes or so (depending on the power of your microwave oven) and finish for about 15 mins in the oven as normal. 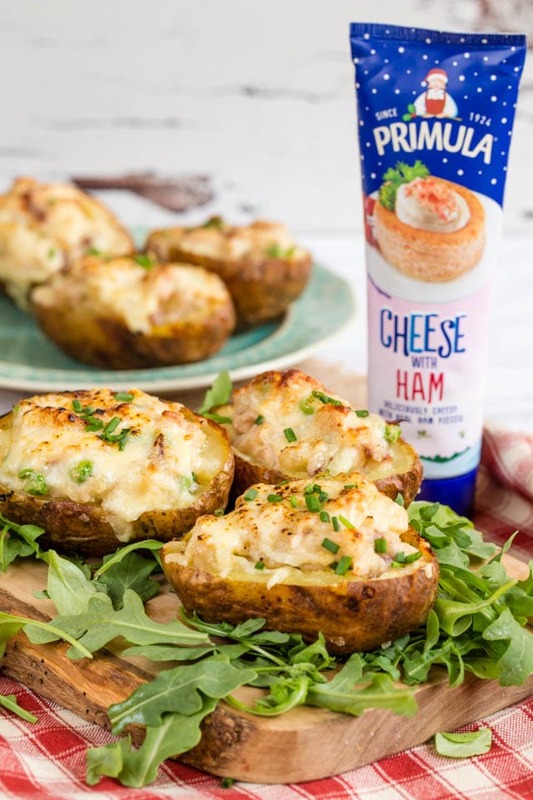 As well as the variety of delicious flavours there are lots of other things to love about Primula, firstly it is such adaptable ingredient – it melts in to pasta and rice dishes, is delicious in dips and is ideal for snacks and sandwiches. Gluten free it also contains no artificial colours or preservatives. As part of the Kavli Trust all profits go to charity – Hurrah! Finally dogs adore the original one, so it makes an excellent training treat – see the photo of Herbert at the end of the post. 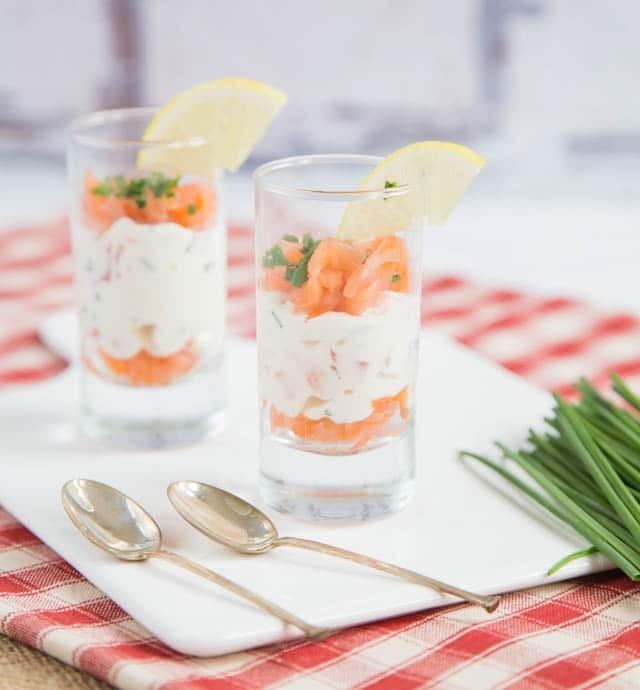 Serve this with my Primula Smoked Salmon Verrines for the perfect Primula festive feast. Love Pasta Bakes? 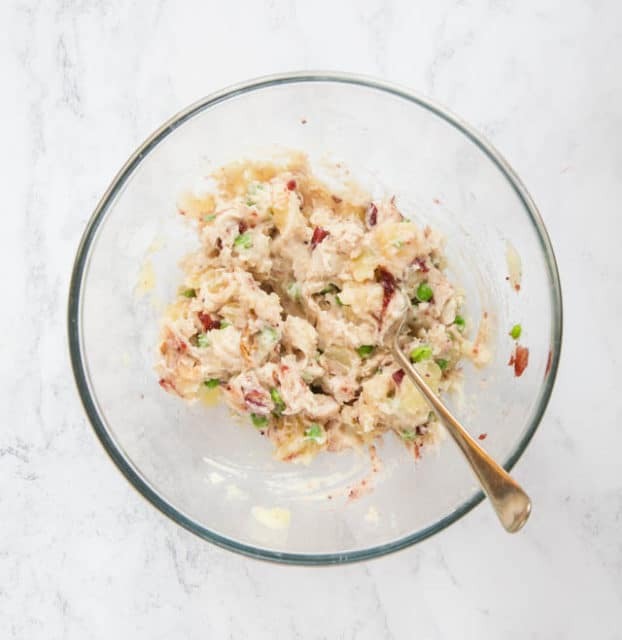 Try my Turkey and Ham bake! If you try this Turkey, Ham and Cheese Stuffed Twice Baked Potatoes (Gluten Free) please tag #FussFreeFlavours on Instagram or Twitter. It is amazing for me when for me when you make one of my recipes and I really do love to see them. You can also share it on my Facebook page. Please pin this recipe to Pinterest too! Thanks for reading Fuss Free Flavours! 100 g finely chopped cold chicken or turkey. Rub the potatoes in vegetable oil, sprinkle on some salt and prick each potato a few times with a fork. Bake potatoes for an hour. Cut them in half, then cut around the flesh of each potato, ½ cm in from the skin. Scoop out the centre into a large bowl. Add to the potato the Primula, peas, cranberry sauce and meat. Sprinkle on the cheese, and reheat in the oven for about 10 minutes. If you want, finish under the grill to brown the grated cheese. Use what you have, this would also be delicious with leftover chicken in place of the turkey, crispy bacon, ham. Try adding pickles or chutneys in place of the cranberry sauce too.